If you follow the latest fashion trends, you know that it is very popular quads on the elongation. How to cut the caret on the elongation? Quite simple. If you know how to hold the scissors, thanks to our detailed description of how to cut the caret on the elongation, you will cope with this task. Graduated four of a kind - like this? - spray bottle with water. Divide the hair into two parts, making a comb with the "tail" of smooth vertical parting. Hair fixing pins, making two beams. 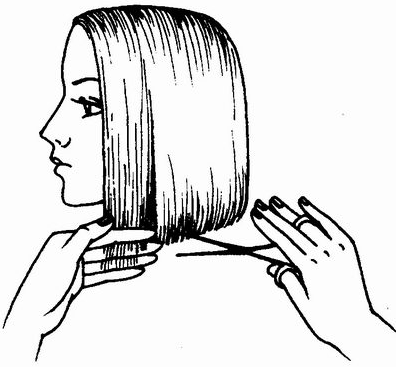 Now on the bottom near the neck horizontally separate the thin layer of hair, cutting it so as to set the initial length of the caret on the elongation. Further, on the thin strand width of about a centimeter detachable hair, tilting the strand at an angle of 15 degrees relative to the head. If you cut the caret on the elongation of the each strand, you can pull. Due to the delay and angle of each strand in the caret on the elongation will be slightly longer than the previous. When you get to the horizontal parting line of the ears - go for a haircut sideburns. Let the temporal strand and pull it towards the vertical parting (which we did when he divided the hair into 2 parts). Carefully cut so that the length of the temporal strands coincided with the length of the occipital strands. When you run a comb through my temporal strand - it will go on lengthening, trim it so that the line was smooth. Next, cut the caret on the elongation under the same scenario: the detachable comb is the temporal strands, each drawn and cut. Now trim the tips of the hair are not sticking out of the hair. The caret on the elongation must be perfectly smooth. Remained the final touch - check symmetry. Take extreme temporal strands from both sides and bring them together, comparing the length. The caret on the elongation - not difficult hair! Make your haircut caret on the elongation look great - use the special plate, smoothes hair. Caret — this is the haircutthat will always be in fashion among the many thousands of women. The beauty of this hairstyle is that there are many types of this hairstyle, so for any type of appearance, you can choose the most suitable. Depending on the styling, this haircut can be casual or formal. While it is quite simple to care for. Hairdressing straight scissors and thinning shears, comb, hair clips (barrettes), hair dryer for styling, spray bottle for water. The caret "on the leg"is one of the types of this wonderful haircut. With it can handle even people who don't have too much experience in hairdressing, as the technology of this haircut is quite simple. It is believed that the caret "on the leg" more than brunettes, as usually their hair is thicker, so better lay in a hairstyle. Although a professional craftsman can do to make this haircut on any hair. The first thing to do before cutting is to wash your hair and squeeze it with a towel. Hair should be damp, not wet. Washed hair well comb. 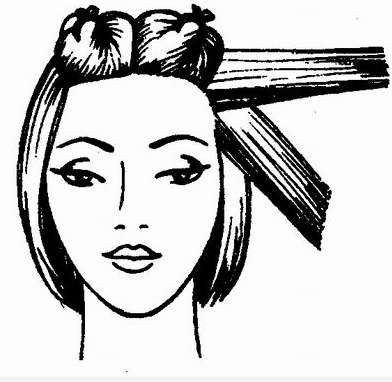 Divide the head into four sections: to do this, draw a vertical and horizontal partings across the middle of the head. With clips the resulting kill zone. You can now proceed to the haircut. Remove the clips from the occipital areas. 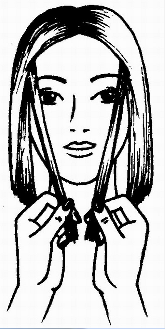 Draw a horizontal parting at the ear level. The top section of hair secure with Bobby pins or clips. The lower part of the trim in the form of a Cape. Then 1-2 cm, separate the hair with one horizontal near the top of the hair clamp, the bottom trim as last time, but making them a little shorter. Continue this sequence until you reach the ears. You can profile the back to look neater. 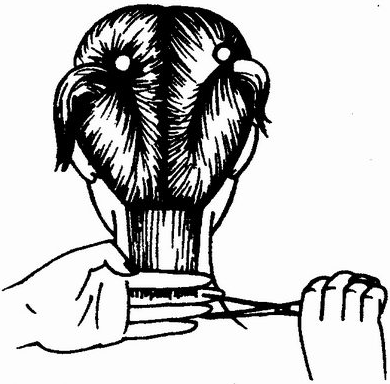 Of the remaining hair at the nape, separate the part with the horizontal parting. Cut to the length that you would like to have back. This will be the base line of the caret. Then 1-2 cm separate another row of hair, trim them at the previous level. Do so until you make all the hair on his head. Now you need to cut whiskey. Free from clip the hair with one hand. 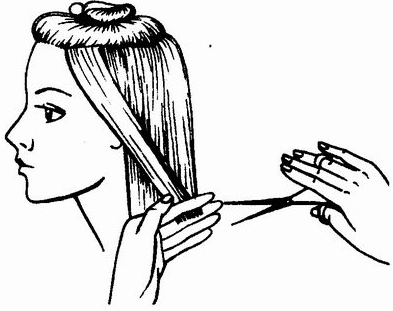 Make a horizontal parting 1-2 cm from the edge of hair growth, most of the re-attach the barrette. The remaining hair trim, extending or rounding out of my face. Again, separate the number of hairs 1-2 cm wide, cut at the same level as previous hair. Similarly, we will process all of the temporal area. On the other hand do the same. In doing so, ensure the temporal and occipital area smoothly transformed into each other, were integrated. Make the bangs. Can make direct or oblique bangs. And you can do completely without it. Here, guided by your taste or desires of the client. Dry and style hair using a hair dryer. Ladies cut quads with angle looks very stylish, modern and sensual. This hairstyle is best suited for fairly thick straight hair. With this species the caret can successfully disguise wide cheekbones, round face and somewhat harsh features. So, how to cut square with the corner. 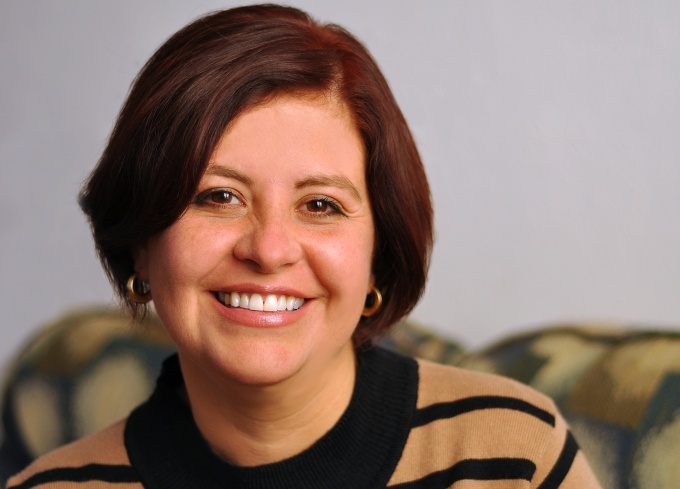 This haircut is one of the variants of the caret, it is perfect for straight, smooth hair. A feature of the caret angle is a significant increase in the length of the strands to the face. The trim area allows you to do this haircut is elegant, modern and stylish. The tips of the hair a little bent inwards. As for length hairstyles, she can reach the shoulders or slightly below. Before you begin to perform haircuts, wash. Then carefully comb the hair with consideration for the direction of their natural growth. Bob angle haircut, the creation of which requires skills and experience in the art of hairdressing. If you are not available, it would be wise to contact the beauty salon, where professional quality and beautifully give you hair. Make a vertical parting, starting from the middle of the forehead and ending at the middle of the neck. After that a horizontal parting across the head from ear to ear separate from the occipital area frontal–parietal. Another horizontal parting need to spend from temple to temple across the top of the ears and the occipital tuber. In each zone the strands and secure with clips. To start the execution of the haircuts you need with the lower back area. 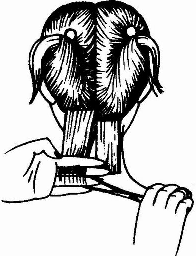 Separate the comb first strand width of from 1 to 1.5 cm parallel to the edge of hair growth in the neck region. If the hair is quite thick, the width of the strands should not be more than 0,5–1 cm. Her comb so that the hair is freely located on the neck. Then trim it a clear horizontal cut to the required length. Have you got a test strand forming the line of the caret. Haircut nape, it is best to start to the left of the vertical parting. Separate the strands parallel to each other with diagonal partings. The slope of the latter must be from ear to mid neck. Continue to cut from the neck to the crown. Cut each of the strands should be straight and clear. Use quickdraw hair on myself. Scroll to the temporal side of the left strand along the horizontal parting, which connects the occipital hillocks and whiskey. Comb hair in the direction of their growth, and then prune them with slight elongation to the face from the back of the head. Next, the strands separate horizontal parallel partings and cut them with a sling at 10-15° to a predetermined level. If you do a cut correctly, each new strand will be 1-2 mm longer than the previous one. Treating the left half of the head, go to the right. To check how accurately you did the hair, separate the strands with a width of 1.5 to 2 cm parallel to the edge of hair growth near the forehead. Zachesov it on the face, compare the level of the cut edge on the right strands with the level of the left — they should be symmetrical. And then, if necessary, adjust the outline of the haircut caret. Separate the hair for bangs are triangular parting. The last width should match the width of the forehead. All otesannye strands roll into a small harness and trim them with one slice. Combing the bangs, the hair point to the face. Make edging in the form of a trapezoid or a smooth arc. That's all, just had to thin out thinning shears hair ends around the entire circumference of the head.